India’s biggest software exporters reported a surge in net profits on Friday thanks to strong revenue growth and a slew of big new deals. 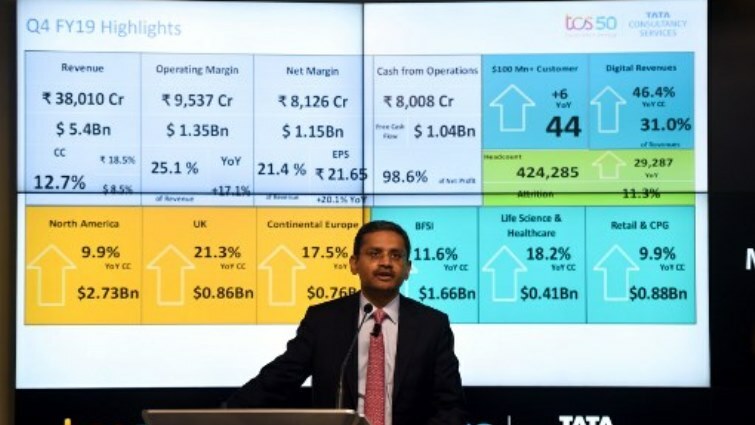 Tata Consultancy Services (TCS), India’s largest IT outsourcing firm, said profits for the quarter ending March 2019 rose 17.7 percent from the same period a year ago. TCS said its revenues has grown 18.5 percent for the quarter year-on-year. “This is the strongest revenue growth that we have had in the last fifteen quarters,” said CEO Rajesh Gopinathan in a statement. “Our order book is bigger than in the prior three quarters, and the deal pipeline is also robust,” he added. TCS’s rival Infosys, India’s second-largest IT outsourcing firm, reported a more than ten percent rise in its quarterly profits. The Bangalore-headquartered company said consolidated net profit for the quarter ended March 2019 notched 40.78 billion rupees ($589.1 million). That was up from the 36.90 billion rupees recorded in the same period the previous year, a rise of 10.5 percent. Infosys said revenues soared 19.1 percent to 215.54 billion rupees. It added that 101 new clients were added during the quarter, bringing their total client count to 1,279. “We have completed the first year of our transformation journey with strong results on multiple dimensions including revenue growth, performance of our digital portfolio, large deal wins, and client metrics,” chief executive Salil Parekh said in a statement. “This is a reflection of our increased client relevance stemming from our focus on digital, positioning, and longstanding client relationships,” he added. India’s $150 billion IT sector has long been one of the country’s flagship industries as companies around the world take advantage of its skilled English-speaking workforce. Indian IT firms are undergoing a period of change in the face of automation and new technologies but continue to boast healthy balance sheets. The post Indian IT giants Infosys, TCS see profits soar appeared first on SABC News – Breaking news, special reports, world, business, sport coverage of all South African current events. Africa's news leader..